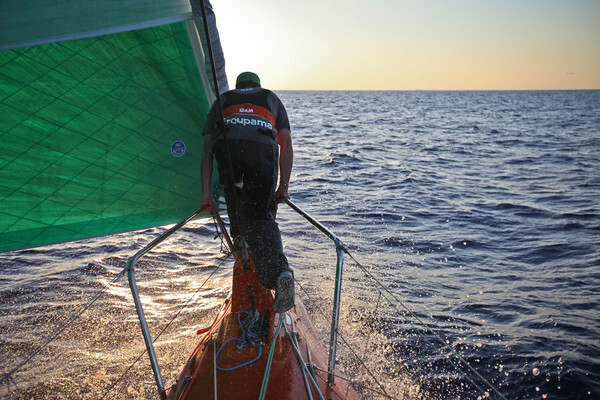 Nerves were jangling louder than ever on Monday as Groupama hauled back Telefónica to take over third place on Leg 6 in a move that threatened to throw the overall race wide open. At the front, PUMA's long-held lead on the leg from Itajaí to Miami was under increasing threat from resurgent CAMPER as the teams plotted their routes through the Bahamas, trying to avoid windless areas over a tortuous final 450 nautical miles.It will be a nail-biting final 48 hours for all concerned, with the two separate battles likely to have huge consequences on the overall race situation. “It’s closer than ever,” said PUMA navigator Tom Addis as CAMPER appeared over the horizon for the first time in several days. 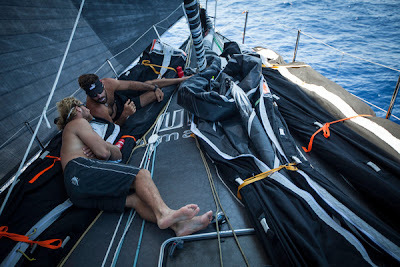 At 1300 UTC on Monday, PUMA Ocean Racing powered by BERG were eight miles ahead of CAMPER with Emirates Team New Zealand with around 250 nm to go to the final waypoint at the island of Eleuthera.A second successive leg win for Ken Read's in-form PUMA would move them within reach of overall leaders Telefónica, second-placed CAMPER and third-placed Groupama on the overall scoreboard -- but victory is far from assured. 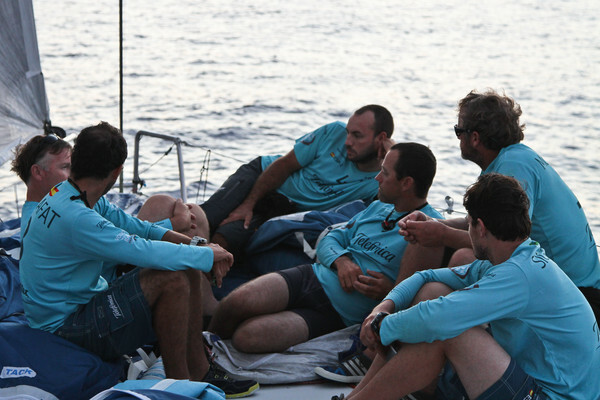 As it currently stands, Team Telefónica lead overall by 16 points from Groupama sailing team. CAMPER are nine points further back and PUMA are a total of 32 points off the pace.The winners of each of the remaining four offshore legs will pick up 30 points, with 25 for second, 20 for third and so on down to five points for sixth. The four remaining in-port races deliver six points for the winners, with five for second, four for third down to one point for sixth. 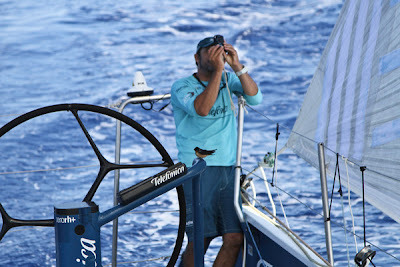 Telefónica's primary goal on Leg 6 into Miami is to finish ahead of Groupama to extend that lead over their closest challengers but they have a lot of work to do if they are to achieve that, with Groupama's decision to dive west inside the Turks and Caicos Islands easing them just ahead of their rivals by the 1000 UTC position report on Monday. By 1300 UTC, Groupama had extended their lead over Telefónica to 11 nm. Their speedy comeback has sent shivers down the spines of overall leaders Telefónica, who were desperately trying to get back up to speed after being snared by a wind hole to the east of the fleet. 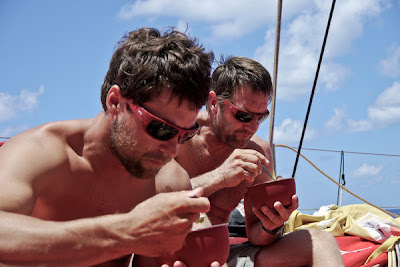 “Things haven't gone how we wanted them to and we're becalmed, watching the boats we've been scrapping with for so long get away from us,” said Telefónica media crew member Diego Fructuoso. “On top of that, the boats behind us are getting closer without us being able to do anything about it. In the battle for first, spirits were high on CAMPER as they eyed up a real chance to catch PUMA in the light winds that lie between them and the finish. 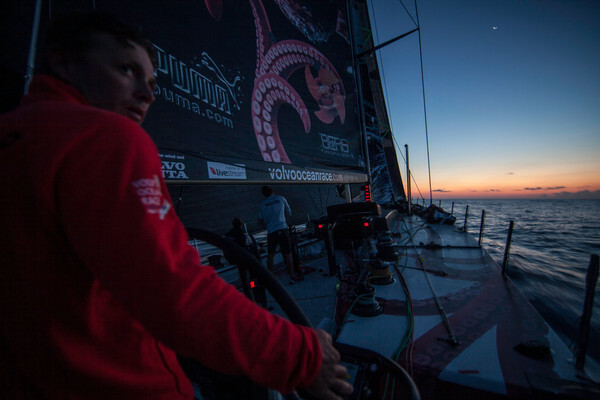 “We are slowly closing down PUMA who got away a bit in a nasty cloud last night, but we are clawing back those miles now,” said navigator Will Oxley. 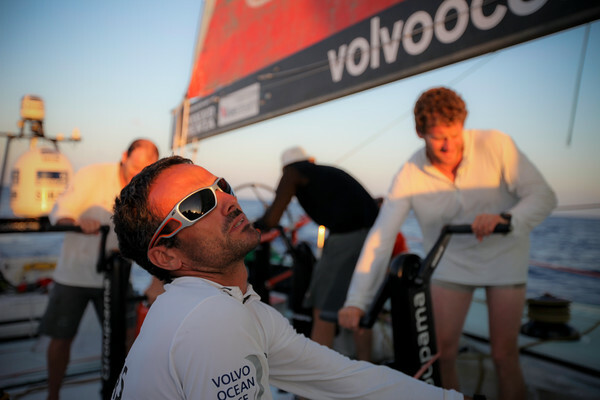 Fifth-placed Abu Dhabi Ocean Racing were back within 100 miles of the leaders at 1300 UTC, opting not to follow Groupama on their westerly route. 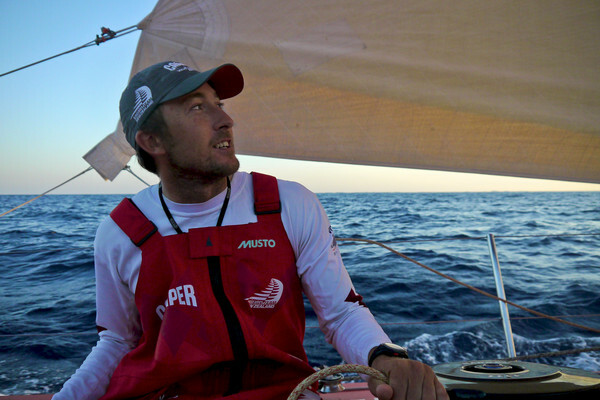 “It is certainly more fun separating from Groupama than following in their wake,” skipper Ian Walker said. The first boats are expected to arrive in Miami around 1200 UTC on Wednesday, May 9.